Joint council leaders David Ross (L) and David Alexander make their way to the chambers ahead of the budget meeting. The expected tax hike was limited to 3%, rather than the maximum level of 4.79% set by the Scottish Government, and will bring in an extra £4.7 million to help balance the books. Local authority housing rents and charges will also go up by 3.2% from April, meaning the average weekly rent will rise by £2.27 per week to £73.25, while charges for lock-up garages have been frozen for another year. Councillors also rejected the more radical suggestions of a workplace car parking levy and a ‘tourist tax’ at the present time, although the savings proposals passed will inevitably have an effect on services moving forward. Around 35 jobs will be lost as a result of the proposals voted through for 2019, albeit compulsory redundancies should be avoided, but a number of savings agreed in previous budgets will be implemented during the coming year amounting to £9.3 million, with the loss of another 78 posts. 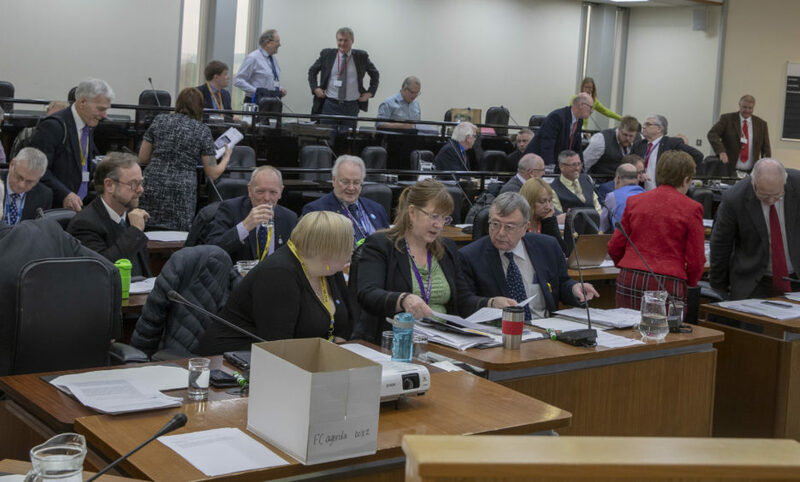 Councillors voted 48 to 13 in favour of the administration’s budget, defeating a Conservative amendment which called on the council to go down the path of outsourcing services to ensure “value for money” for taxpayers. The Tory amendment was savaged by administration councillors as it did not provide full figures on how it would achieve a balanced budget. Council co-leader and SNP councillor David Alexander accused the Tories of “epic cowardice”, while Labour councillor Linda Erskine said she would not be part of a “wholesale sellout” of services. SNP councillor John Beare said the Conservatives were “painting by numbers, but they forgot to put the numbers in”, while Labour council leader David Ross branded it “delusional, hypocritical and dishonest” to say outsourcing is the “curer of all ills”. However, Conservative councillor Tony Miklinski said the approach was “an opportunity not a threat” and said the SNP and Labour spend more time “obsessing about their own ideologies rather than thinking about the needs of taxpayers”. The council chambers ahead of the budget meeting. His colleague Councillor Dave Dempsey said the SNP/Lab administration was unwilling to even consider using the word outsourcing, describing them as “ostriches on steroids”. “Their heads are buried so far into the sand we’re struggling to see the soles of their shoes,” he said. Despite the amount of cash the council has available to invest in additional services being at a “historical low point”, £1.15 million of investments will be made. That includes the innovative year-long ‘holiday hunger’ trial which will see £400,000 spent on providing free lunches at 24 schools serving some of Fife’s less affluent communities during the school holidays. However, Conservative councillor Linda Holt criticised that plan, calling it a “patronising throwback to the time of soup kitchens”. Around £300,000 has been earmarked to address the deterioration of headstones in cemeteries, while cash will also be available for anti-poverty initiatives and to support lone parent charity Fife Gingerbread. Meanwhile, councillors have also approved its capital investment plan for the next 10 years – with schools very much at the heart of it. Around £90 million has been allocated for new primary schools, to accommodate housing expansion across Fife, while the expansion of early learning and childcare provision – in line with the Scottish Government’s commitment to 1140 free hours per year– is highlighted in the first two years of the plan. Funding has similarly been earmarked for the replacement of Inverkeithing, Woodmill and St Columba’s High Schools, extensions to secondary schools and the replacement of Glenrothes and Glenwood High Schools, although the council’s ability to deliver those will be dependent on “significant” levels of additional capital funding from the Scottish Government. A total of £8 million for the coming years has been set aside for roads infrastructure, almost £2 million more than previously outlined for that period. 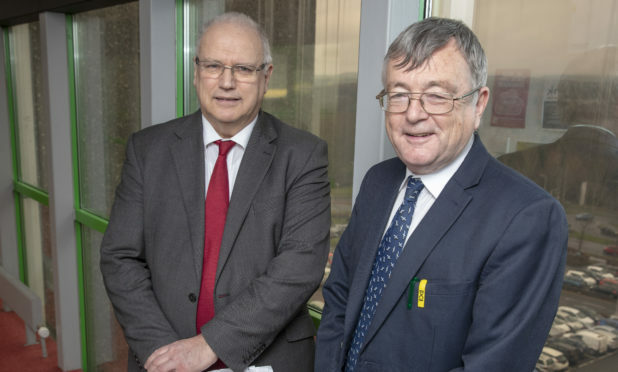 Provision has also been made for the replacement of the council’s remaining three care homes, together with provision for revamped facilities in Abbeyview in Dunfermline, Templehall in Kirkcaldy and Glenwood in Glenrothes.